Written by our partners at Rio Grande, one of the largest jewelry suppliers in the US and a B9Creations dealer, this case study is a wonderful customer testimonial on how the B9 Core Series 3D printers can help your jewelry business keep up with the technological shifts in the industry. In 2014, Javier Odom, Director of Operations at Walt's Jewelers in Gilbert, Arizona, realized that he needed to introduce 3D printing to his business to better position his business with the technology advancements in the jewelry industry. 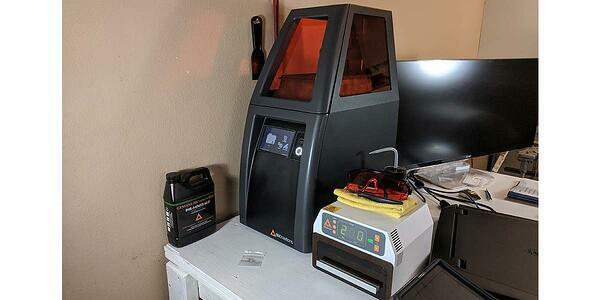 Javier recently shared how he came to this realization, how he went about making it happen, and how he ended up choosing a B9Creations Core Series 530 3D printer. My name is Javier Odom, and I am the third generation here at Walt's Jewelers. My grandfather, Walt, founded our business in 1956, in a small mining town in Arizona. In 2014, I went from active-duty Army into the Army reserves and began transitioning into my new role as the primary owner at Walt's Jewelers. The jewelry industry, as a whole, seems to hold onto tradition in a lot of areas, sometimes to its own detriment. At the same time, younger generations are often too eager to jump onto the latest technology bandwagons. This is where my father, Samuel, and I have a very good balance. I have a strong technology and analytics background; and he, with more than forty years of knowledge and great experience behind him, is my most trustworthy adviser on how best to guide our family business. Together, we decided we needed to better position ourselves for our clients by incorporating 3D rendering and printing into our day-to-day business operations and began laying the groundwork to do just that. The B9Creations Core Series 530 3D printer system set up and at home in Walt's Jewelers. Over the course of our search, which seemed to turn more into a journey, we researched, compared and examined several brands and models of printers. I had narrowed my choices to the B9Creations Core 530 and another machine that we considered of similar caliber. The results of the side-by-side comparison of sample prints from each manufacturer provided us a final decision. B9Creations produced a cleaner print, ready to be cast. The print from the other machine required additional cleanup before it could be cast. This is a minor detail to some but, the way we see it, if they are not willing to pay attention to these types of details to showcase their capabilities, then where else are they cutting corners or allowing apathy to supersede quality? My father and I very much appreciated this "minor" detail. Then, with regard to casting, the other machine's resin seemed to require a little more effort to get a clean cast. The B9 Emerald resin was essentially just like the casting waxes we have used for decades. There was no real transition from traditional waxes to the Emerald resin. This has a huge impact on our return on investment, for the short term and especially for the long-term. Having an easy casting procedure allows us to focus on other tasks, which lowers my overhead costs per print/cast. By this point you are probably fairly confident that we prefer the Core Series machine over its competitors. Hopefully, you were already confident of this from the beginning. Perhaps a couple more nails in the coffin? Cost. The competing machine we looked at had a price tag of roughly $25,000. Quite honestly, if we had chosen that machine, we probably would have opted to find a couple printing services that have that machine and simply outsourced our printing to them. We think that high a price tag is ridiculous given that the product is not superior in any fashion. The B9Creations Core 530, with its $10,000 price tag, has destroyed every competitor we have thrown at it. Service. We purchased a B9Creations Core 530 from Rio Grande, as well as the model-curing light box. We also purchased an extra 1kg container of Emerald resin. We received these three items Monday. We set it up yesterday, and Scott, with Rio Grande, spent an hour on the telephone with us, walking us through the setup and familiarization, answering questions, and giving tips the entire time. Scott had an impact on which machine we chose as well. We have been talking with him off and on for around a year. I have the original B9 sample print on my desk right now. It is almost like a trophy. It is certainly a symbol of great things to come, thanks to your product. 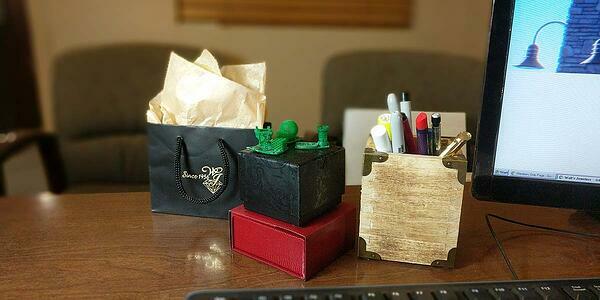 Javier's desk at Walt's Jewelers with his "trophy" sample prints from the B9Creations 3D printer. We couldn't be happier to have helped Javier and Walt's Jewelers take their first steps into this exciting technology that's revolutionizing jewelry design and creation with 3D printing. Learn more about the B9Creations Core Series 530 printer. Are you considering taking a step into the future for your business? Rio Grande is here to help; let us know if you have questions or need more details about 3D printing and the B9Creations Core Series 530. Our experts stand ready to show you what the Core 530 can do for your jewelry production, to create a sample print for you, and to discuss the options available for your business.